Jeff: What kind of fiddle sound do you like? Clyde: I like a medium tone. Jeff: What does that mean? Clyde: Well, that’s between high and low. 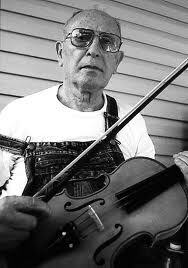 That’s the kind of fiddle I like. I like one that you don’t have to ride your bow to make it come out. Of course I’ve got one that’ll do that, well, actually two. One of them’s not a loud fiddle. That one I’m playing now, you have to bear down on your bow a little. Jeff: Just a little bit. When you say a medium tone that’s not high or low? Clyde: No, you’ve heard coarse-toned fiddles; you’ve heard keen-toned fiddles. Jeff: Oh, I see what you’re saying. Clyde: I like them between. A coarse- toned fiddle’s rough. And a keen, high tone is too keen. Medium’s just right. I know my fiddles. Jeff: What about the different keys that you play in? Do they have a different kind of quality to them? Clyde: Well, they’re different keys, right smart. A’s a high key and D is a low key, E is a low key, Bb is a low key, and C, did I call C? They’s a difference. D is sort of in between; G key is a like a standard. Jeff: I notice you play a lot of tunes in G.
Clyde: Well, that’s where I always heard them played. The old people didn’t know one key from the other. They could play in G [but] they didn’t know what they was playing in. They could play in C, and they didn’t know what they was playing in; they could play in D and didn’t know what they was playing in. That’s the three keys they played in. Mostly all was played in G.
Jeff: What about. did they retune the fiddle? Clyde: Yeah, they cross-keyed their fiddles. Clyde: Yeah, now, some of them I never did hear do that. Leonard Rutherford, I never did hear him cross-key his’n. Jeff: Do you think of certain tunes as having different purposes, like some for listening and some for dancing and so on? Clyde: Well, some of them’s just listening music. A slower piece is listening music; a fast piece is a dance piece, but still I like them better. I like to play slow pieces. Sitting around playing by myself, I’ll play slow pieces. I’ll play both, of course. I used to know a lot of slow pieces that I don’t know now. Clyde: Square dancing. Oh, I played for buck dancing, stuff like that. Jeff: Are certain tunes better for square dancing and others better for buck dancing? Clyde: Square dancing and buck dancing, you can use the same tune. I never did like a waltz, though, and I never would play them. Never did like them.